Rope molding carved from a toothpick is used to add detail to the side of a simple dolls house cabinet from a big box store. Photo copyright 2010 Lesley Shepherd, Licensed to About.com Inc. I was going to subtitle this tutorial If You Can Peel A Carrot You Can Carve a Miniature Rope Moulding. Many scale model and dollhouse details are easy to carve. The rope molding shown here is carved from a round wooden toothpick just to illustrate how simple it is to practise and create. If you can correctly angle a paring knife to peel a carrot, you can carve this molding. Once you have the technique down, you can carve it directly onto the edges of miniature furniture, bases for lamps, or a number of other miniature and full size projects. It is a useful molding trim for dolls house doors, scale picture frames, and cabinets, and can be easily carved for scales 1:24 and up by adjusting the size of the material you work on and the measured carving lines. The molding shown here was carved using a curved #12 scalpel blade, but it is also fairly simple to carve with a sharp #11 or #28 (concave curve) hobby knife blade, or a pocket knife. The scalpel blades can usually be used in a range of carving and craft knives. If you are hesitant about carving in miniature, practise the cuts on a carrot, using a paring knife, then just reduce the scale! Safety Note: Before you begin carving, make sure you are using safety eyewear and using appropriate hand protection for the items you are carving. Do not carve with dull blades, and carve only when you are relaxed and attentive. Carving knife with scalpel blades, cutting made, ruler, sandpaper, tootpicks and friction tape used to carve miniature rope moldings for dolls house details. Photo copyright 2010 Lesley Shepherd, Licensed to About.com Inc. Suitable Knife and Blade Check the information on hobby/craft and carving knives. This molding is very simple and can be carved with craft knives, scalpel blades, fine carving blades, or a sharp pocket knife. If you intend to carve a lot of miniatures, you may want to invest in a proper carving knife. I like using a Veritas Carver's knife which is designed as a detail carver for use with scalpel blades. It fits well into my small hands (or my husbands large ones) and provides a comfortable and secure knife grip. I often use my standard Swiss Army knife for these simple carvings as well. Sharp Pencil to mark fine carving lines. Masking Tape to hold dowels or toothpicks when marking them. Material to Carve I suggest you practise on round wooden toothpicks which make useful short lengths of moldings for door frames or pictures. Bamboo skewers are not suitable, but if you can find them, wooden skewers work well. You can of course carve lengths of half, quarter, or round dolls house moldings or craft wood as well. Basswood or Jelutong work well for practise. Hand Protection Latex coated gauze tape sometimes called 'carver's tape' or high - friction guard tape will protect your fingers slightly against knife cuts. Wrap it around the thumb of your carving hand, and the fingers which hold small parts if you don't hold them in a pin vise or clamp them to your table. A Kevlar 'carvers glove' for the hand which holds parts is very advisable! Fine Sandpaper I used 160 and 600 grits to round the sections of my miniature rope. You need very fine sandpaper to fit into the lines of the rope without losing the line definition. Pin Vise Useful but not essential, depends on the size of material you are using. Lap Protection Carvers wear aprons for many reasons, one is to protect themselves from blades and wood splinters! Measure and mark 1/16 inch divisions on one side of a toothpick or thin dowel, and mark the other side, beginning 1/16 inch down, so that the markings are in the middle of the ones on the first side. Photo copyright 2010 Lesley Shepherd, Licensed to About.com Inc. When starting to carve, it is easiest to work with small sections of material. Fine material breaks easily in longer lengths. The length of a toothpick is ideal to start with, as you can clamp it to a cutting board or hold it in a pin vise. If you are using a round toothpick or section of dowel, sand the back of it with medium sandpaper on a sanding block to help it lay flat while you mark it. I try to keep toothpicks as round as possible until final finishing as it helps prevent them from breaking. You can mark your wood either every 1:16 inch or every 1/8 inch depending on how fine you want your rope molding. In the following instructions I mark it for the molding shown in the photos, which shows a 1/16 inch wide segment, equivalent to roughly 3/4 inch in 1/12 scale. Lay the wood onto a cutting surface and clamp it firmly in place, or hold it firmly with masking tape on both ends while you mark it. Place a metal ruler alongside it as shown in the photograph and mark a start line across the curve from one side to the other. Mark off 1/16 inch segments down one entire side of your work piece as shown. Move the ruler to the opposite side of your wood. On the second side of your wood, offset your ruler so that your starting mark is on the first 1/32 mark on your ruler, and mark off 1/16 inch segments from this starting mark. You will see that the marks on one side of your toothpick are centered between the marks on the other side of your toothpick. Measuring Tip . Keep your pencil marks in an even line at the edge of your ruler and keep them as straight as possible along the side of your piece of wood. Accurate marking will make more even molding. Connect the 1/16 inch markings with angled lines to mark the carving lines for a dolls house scale miniature rope molding. Photo copyright 2010 Lesley Shepherd, Licensed to About.com Inc.
To draw the carving pattern for your miniature rope molding, use a fine pencil to draw the agnled lines that connect the marks on one side of your carving material, with the other side of your material. If you find it difficult to draw over a curved surface (toothpick or dowel) you can make a simple flexible curve from a scrap of the straight edge of clear plastic packaging. Mark the edge of the plastic with a permanent felt tip marker to make it easier to see, then hold it in place over your carving surface and use it as a guide to connect your markings with pencil lines. When you have finished, all your pencil lines should be the same distance apart, and all of them should be at the same angle. If not, erase problem lines and correct them. A Veritas carver's knife showing a stop or straight up and down cut on a toothpick rope molding. Photo copyright 2010 Lesley Shepherd, Licensed to About.com Inc. The first basic cut in many carving projects is the stop cut, a cut which marks the lines and sets a clean edge for other cuts to meet. The stop cuts for the rope moulding are used to mark the bottom of the 'valley' between the rope lines. Your goal should be to hold your blade so that it cuts straight down into your marked carving lines to a uniform depth. As you are carving a rounded surface you can do this by tilting the knife over a carved piece clamped to a flat surface, or by holding your work piece (if it is fairly small) in a pin vise, and gently rotating the piece against the blade. Either method takes practise to keep the pressure of the knife cut even across the curved surface. Make a straight stop cut along every angled line you drew across your work. An angled cut is made back to the stop cut to form one side of the rope on a dolls house scale rope molding. Photo copyright 2010 Lesley Shepherd, Licensed to About.com Inc. The second and third cuts for each section of your carved rope moulding are angled cuts, one above the stop cut and down to meet it at it's base, and one below the stop cut and up to meet it at the base. I tend to make all my cuts down to the stop cut, then reverse my piece of work and make all my matching cuts down as well. Some people prefer to make a down angle cut, and then an up angle cut and move on to the next line. Rope is slightly rounded, even when it is wrapped tightly around a surface. The angled cuts you make on either side of your stop cut will set the shape of your rope. Try to hold your blade at a matching angle for every angled cut you make. This is easiest if you cut all the angles in the same direction to the stop cut, one after the other, either up or down your length of carved moulding. For this fine moulding, keep the angle of your knife to a minimum and start with the top cut (above the stop cut) finishing your cut at the base of the stop so that you have a neat valley with no splinters. A Pin Vise Can Be Used To Hold Dowels or Toothpicks For Miniature Carvings. Using a pin vise to hold a toothpick while carving a miniature rope molding. Photo copyright 2010 Lesley Shepherd, Licensed to About.com Inc. If you have difficulty carving across a rounded surface clamped to a work bench, you may prefer to hold short lengths of fine dowel or toothpicks in a pin vise while you work on them. The pin vise will clamp the piece securely, and give you a better grip, further away from the section you are working on. This is only useful for short lengths of carving material, as small diameter dowels will flex too much to carve if you use longer sections. Knife cuts for a scale miniature rope molding. From left to right, straight cuts, angled cuts on one side, angled cuts on both sides of the straight or stop cut to shape the rope. Photo copyright 2010 Lesley Shepherd, Licensed to About.com Inc. The photo above shows the three cuts used to carve each segment of the miniature rope. The cuts on the left of the photo are the straight cuts. In the center section you can see where the first angled cuts have been made to the right of the stop cuts (straight cuts) and in the section farthest on the right you can see where an angled cut to the stop cut has been made above and below the stop cut. When all three cuts have been made on each marked line of your carving, your piece is ready for finishing and sanding. Make a Simple Sanding Block To Finish Fine Line Carvings. A scrap of flexible plastic packaging is inserted in a fold of 600 grit sandpaper to make a narrow sanding block for a miniature rope molding. Photo copyright 2010 Lesley Shepherd, Licensed to About.com Inc.
To finish your carved miniature rope moulding you need to round the segments of the rope, while keeping the carved valleys as narrow as possible. Depending on the scale of your carving you can use a single piece of fine sandpaper mounted on a strip of plastic, or a double sided strip mounted on a piece of plastic. For the scale of my carving, I used a small strip of 160 grit sandpaper to round the top edges of each section of my rope. When that rough sanding was finished (see photo next page) I made a sanding strip by folding a piece of 600 grit sandpaper in half over a thin section of flexible plastic cut from the edge of a plastic package. This support allowed me to gently round off the edge of each of the rope sections, without widening the space between them at the base of my carved 'valley'. Three stages in finish sanding a dolls house scale rope molding, using 160 and 600 grit sandpaper. Photo copyright 2010 Lesley Shepherd, Licensed to About.com Inc. The photo above shows the stages in finishing the miniature rope moulding after carving. The object is to keep the carving lines as crisp as you can, while rounding the sections with sandpaper to make them the correct shape for rope. As you can see in the photo above, the original carved molding has very little rounding of the sides of the segments. A 160 grit paper was used to round the side edges round to the top of the carving. A final finish was made using a 600 grit sandpaper to clean out the valleys and finish the surface of the moulding. Do not oversand the carved areas between the rope sections! If necessary you can remark the valley lines with a carving knife to keep the carved areas crisp. When you have finished sanding your section of moulding, you can sand away the rest of the back of the dowel or toothpick with a sanding block to make a half round strip of moulding. I don't sand the moulding to its half round shape until I have finished carving it, as I find a rounded section of dowel is stiffer and less likely to break when carving. If you prefer, you can use a sharp blade to split your carving in half to make two sections of quarter round moulding after you have sanded away the back. You need a very sharp pointed blade (# 11 scalpel) to do this, with the carved section firmly clamped to a cutting surface. A section of rope molding hand carved from a toothpick shown in the edge of a panel on a dolls house door. Photo copyright 2010 Lesley Shepherd, Licensed to About.com Inc. Even toothpick length rope mouldings have a number of uses. 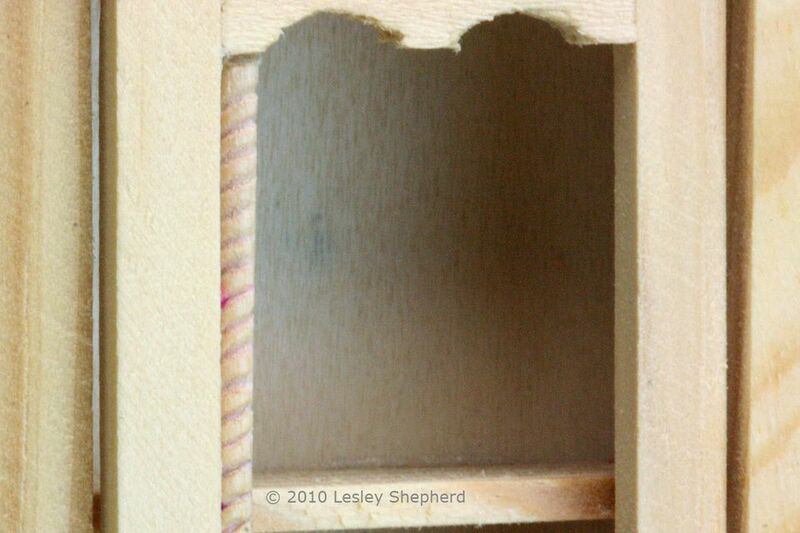 You can easily miter small sections of mouldings to accent the panels on dolls house room doors, or cabinet doors. Here a half round section of moulding is shown temporarily sitting over the straight edge beneath it. You could miter sections like this in place around the panel and glue them down, or you can split the mouldings into fine quarter round sections and glue them to the inside edges of the upper casing holding the panels. Section of hand carved scale rope molding shown on the edge of a dollhouse shop counter. Photo copyright 2010 Lesley Shepherd, Licensed to About.com Inc.
Carved rope mouldings are a nice detail along the edge of stock miniature furniture. You can carve a moulding separately and glue it to the edge of the piece, or glue sections to uprights as decorations, or you can carve the rope on the edge of a piece of furniture. Once you are satisfied with your rope carving skills, try rounding the edge of a flat board and carving a rope along the edge instead of around the curved edge of a toothpick. The technique is the same. As you gain skills at using fine knife blades, you can create a stop line along the edge of your carved rope, and carve a line at 90 degrees to the stop line to set off the rope with a small flat decorative edge. Experiment with this simple technique and you will find many ways to dress up ordinary miniatures.